“Carry on until the big McDonalds and then turn off”. These are the directions we receive for driving the Cultivate VegVan from Oxford to Westmill Organics farm, near Swindon. It’s a fitting diversion. The methods and ethos of Westmill point away from the burger bars and supermarkets on the main road. This is a farm committed to organic food and community building, drawing on years of experience. And while the chains on the A-road signal their presence with glaring neon, the entrance to Westmill Organics is marked by a large, hand-carved wooden carrot. 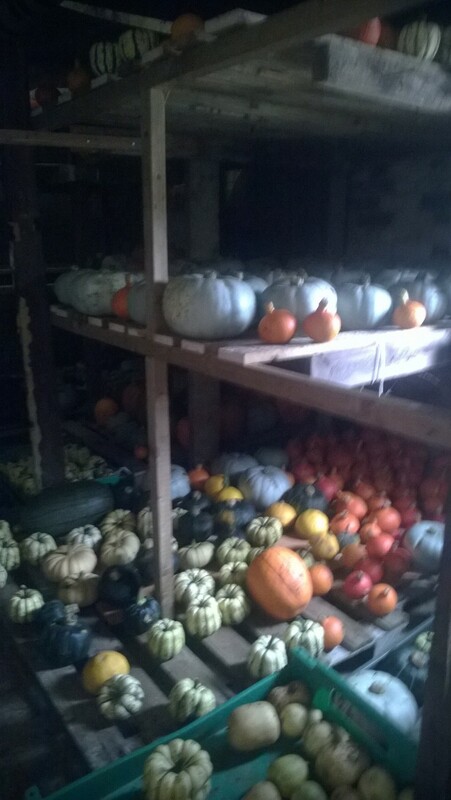 We pull into a large farm yard and peer inside a nearby barn, discovering a treasure-trove of squash. Every colour and shape imaginable wait here, stacked from ceiling to floor. Show these photos to friends who think squash begin and end with butternut. Soon we are greeted by their proud father – Pete Richardson. Pete is the man behind Westmill, a farmer who has been growing organic fruit and veg for 16 years. He’s a member of the Thames Organic Growers, the supplier of much VegVan produce and, for today, our guide across the fields. Pete’s fields span a spacious site, which allows him to grow a wide range of veg and experiment with different organic methods. The land rolls gently up to five majestic wind turbines, part of the Westmill solar co-op, the UK’s first community-owned solar power farm (one of our Cultivate board members also sits on their board). Already the turbines feel like icons. Any wind-power naysayers should behold this view. We could not help but agree with Will Self and the head of the National Trust that, in centuries to come, wind turbines will be admired as part of the English rural landscape. 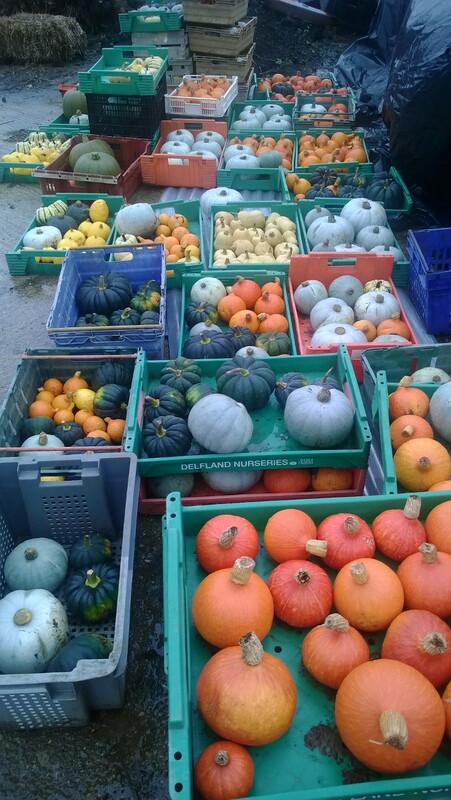 The beauty of Pete’s veg, meanwhile, has already been captured by another of the Westmill team, Boann. Her artistic eye has resulted in some striking photos and we’re hoping to display a print of one in the VegVan soon. It’s been a good year for so many of Pete’s varieties. Rows of leeks and cabbages look fantastic, while corn still sways in the wind. Carrots are on the way. Growing organically means that soil fertility needs to be managed without artificial fertilisers. Pete shows us one secret of the success: green manure, a mixture of vetch and rye. In letting the vetch go to seed, Pete is doing something that veg growers theoretically ‘should not do’. But this is another example of experience trumping textbook. Pete knows what works for him. At the same time, he is not afraid to recount mishaps. Spring winds blew away one of the six polytunnels. It took off and landed spectacularly in a hedge! 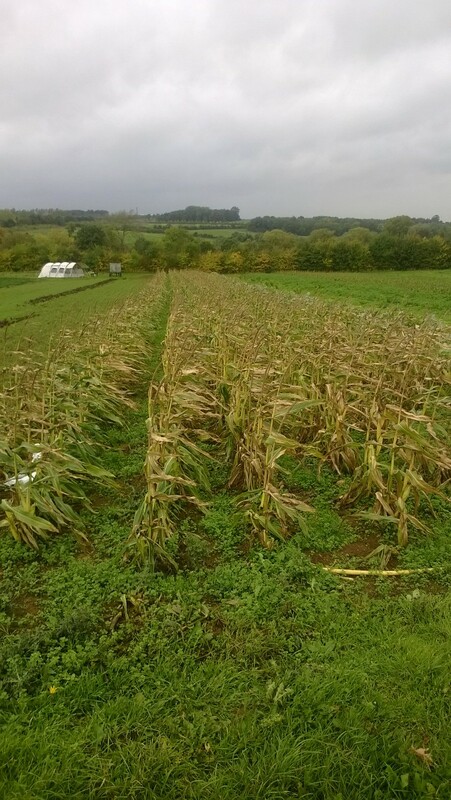 No veg were injured as it was early in the year, but the lift-off forced a rethinking of cropping plans. All this is part of the life of an organic farmer; Pete must respond to seasonal currents. 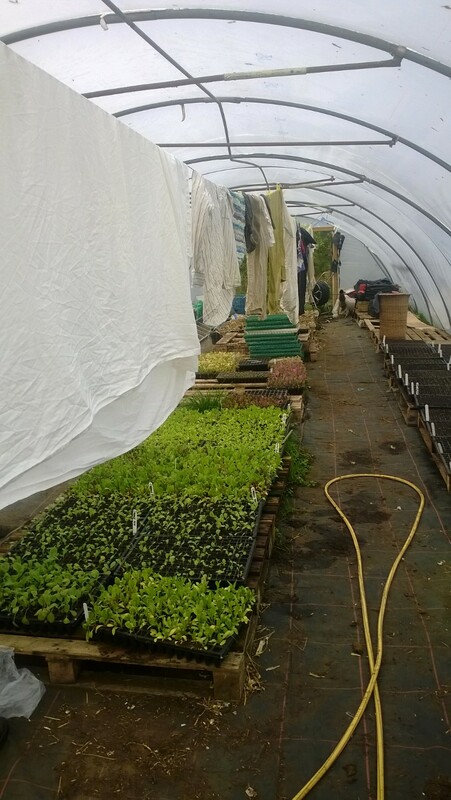 In one of the surviving tunnels, where Pete also dries his laundry, we pick up tips for the Cultivate farm: no need to water tomatoes after August! (We’ll continue to dry our clothes elsewhere for the time being). “Now, how about a cup of tea?” As the light fades, we head back towards the farm cottage. 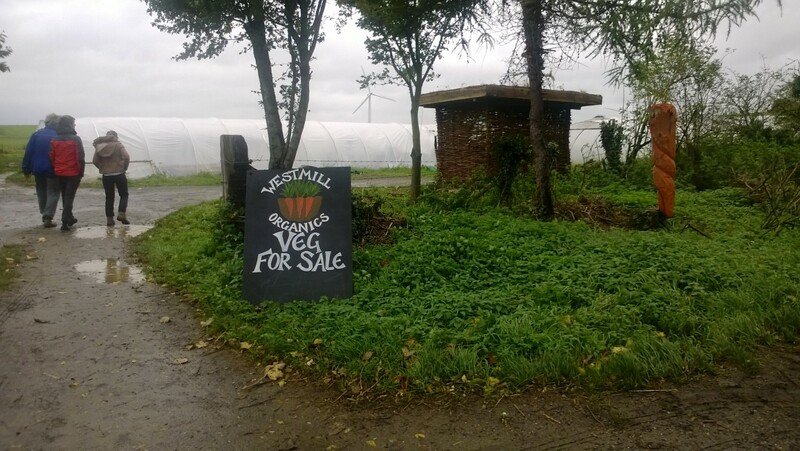 At the entrance to the farm buildings, we pass Westmill’s newest addition: the Veg Hut. 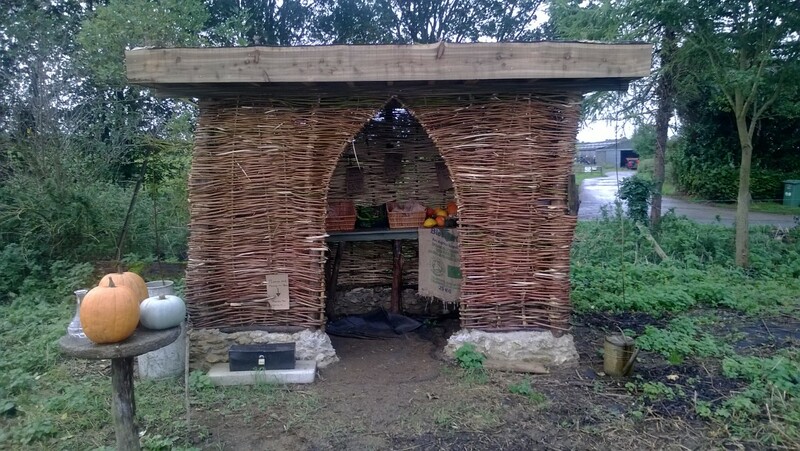 Here passers-by can stop and pick up fresh produce on a daily basis. The quantities have been managed so that everything costs £1, with a simple honesty box for payment. But Pete hopes that visitors will have time to call in for a chat too! Getting people out to the farm and engaging with local communities matters to the whole team at Westmill. Inside the cosier sitting room, we discuss other initiatives Pete supports and how Cultivate and Westmill can work together over the next year. 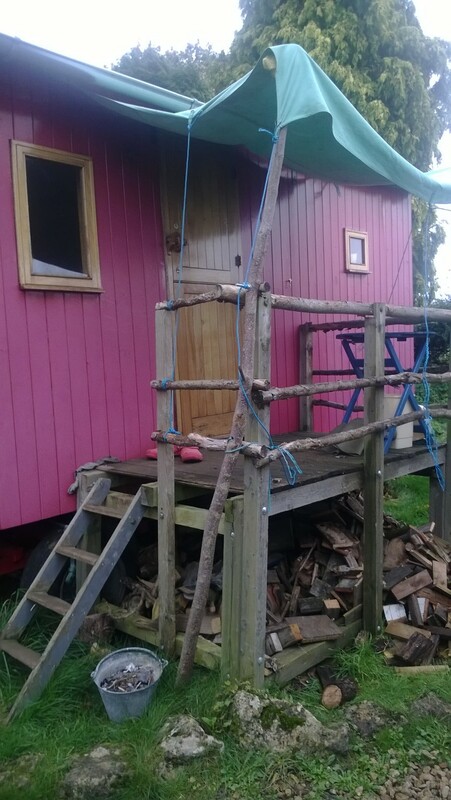 We are joined by Jonathan, a WWOOFer volunteer and current resident of the small wooden caravan parked outside. Westmill hosts 3-4 WWOOFers a week throughout summer and the mix of nationalities creates a vibrant atmosphere. Pouring our drinks is Boann, a key cog in the Westmill wheel. 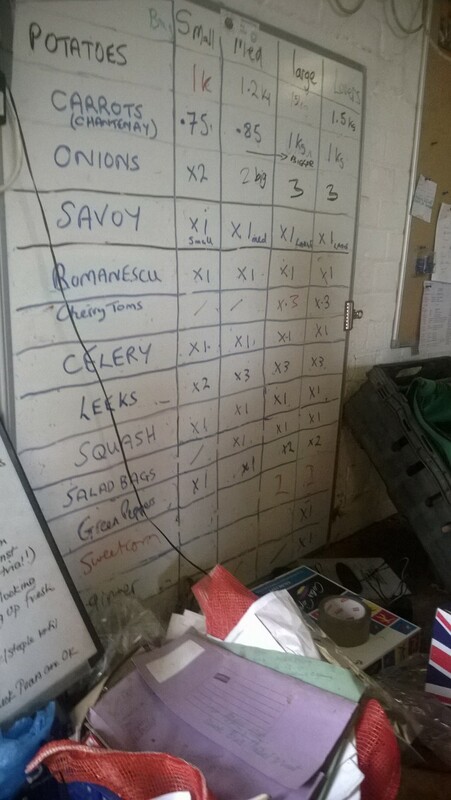 Boann masterminds the Westmill veg boxes and manages the tight weekly schedule. Picking on Tuesday, packing on Wednesday and then, on Thursday, Boann drives to Oxford to deliver boxes to homes and veg to the Cultivate VegVan. Pete has seen demand soar over the past year. This is because his veg tastes great, and maybe also reflects the wider resurgence in the organic market, as reported by the Social Association. 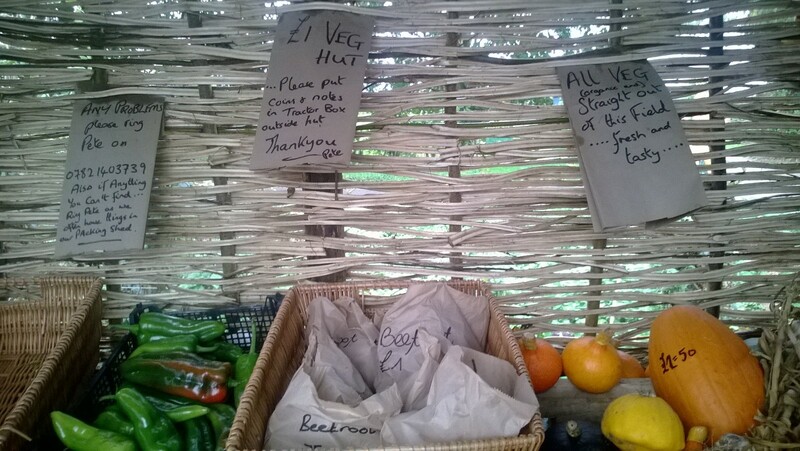 We’ll certainly be stocking Pete’s organic veg over the coming months. Discussing plans in your supplier’s sitting room – this is what a food system should look like. As Pete remarks as he shows us out, both sides benefit from this kind of relationship. 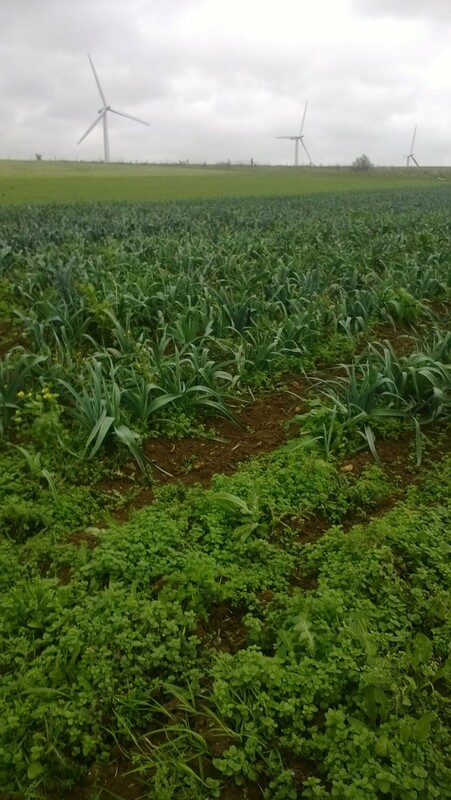 Great blog about @CultivateOxford suppliers @WestmillOrganic by Chloe. http://t.co/8rOU398AcI. More to come, Tiddly Pommes apple juice next.